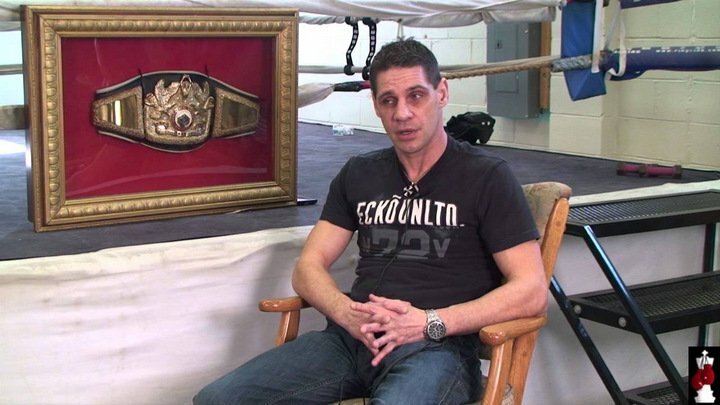 By: Lou McLaughlin – Darren” Checkmate” Maciunski was a former top level super welterweight contender in the 1990’s. He fought from 1992 through 2002. Interestingly, he got his fighting nickname “Checkmate” from having been an avid chess player as a young teenager and compares boxing to a chess match. He finished his career on a win against Leo Edwards and a record of 20 -8 in 2003. His record does not adequately describe his career. He had 40 amateur bouts before turning pro and fought many of the major names of that era including Kevin Kelly and Fernando Vargas. He had wins over vastly more experienced boxing luminaries veterans Meldrick Taylor then 34-3- 1 and James McGirt 73-4-1. He fought on major televised networks including HBO, USA’s Tuesday Night Fights, and ESPN. His career took him to Australia, Denmark, and Italy. Darren moved up in weight and also won the IBF Inter-Continental Middleweight Title with a 4th round TKO in 1999. He was not matched easy and ducked no challenge. There was a time in his life that was very turbulent and troubled. There was a time of extensive substance abuse during his career and after. But he has found personal peace, spirituality and sobriety and is in a very good place and positive state of mind nowadays. In 2009 he was inducted Into New Jersey Boxing Hall Of Fame. Darren has opened up his own gym, which is called the “Checkmate Boxing Center”. He trains kids, seniors, anyone wanting to get in shape, and aspiring amateurs. It is his goal to get involved at the professional level. Q- What got you a kid who liked playing a cerebral game like chess into the physically demanding sport of boxing? A-I didn’t get into boxing until I was 19 when my Father took me into a gym. Before that I was just having a good time and didn’t have any real direction in life. I had a friend Mark Rashawn; he was a few years older than me who really introduced me to chess. In the beginning he was always beating me at chess. But I kept playing and playing and got to the point that I could beat him, finally beating him all of the time. Then I decided to join the chess club in school. I played every day for a couple of years. I ended up Captain of the chess team of the Toms River high school. This was all before boxing. My Father got me going to the gym to keep me from hanging out and possibly getting into trouble. He got me started at the Howell, N.J. PAL. I was 19 years old. I was very rough very unorthodox. It was there I learned how to spar. It was about a half hour drive from the gym to home with my Father. If I’d done well that night he would speak nicely with me going home. If I did badly he would yell at me all the way home. Q You had a 40 bout amateur career, did you ever think of taking the amateur route to the Olympics or other national exposure? And what prompted the decision to turn pro? A-In the amateurs I was pretty successful. I won a few Silver Gloves championships, The New Jersey Diamond Gloves Championship two years in a row, and the New Jersey Golden Gloves Championship in the Novice Division in 1989. A year later I won the 147 lb. Open Class title New Jersey State title. I competed in the National Golden Gloves but lost in the semi-finals. I decided to try myself at pro. My first trainer was Pat Ritti. After a year or so I started training out of Trenton with Muggsy Episcipo. I won my first 8 in a row. Then I fought Billy Mastrangelo, I felt that I won that fight. It was a good fight and I ended up on the short end of a split decision. My losses were in my biggest fights but they were sensational fan pleasing fights as I gave my all. I fought some big names, because people could see that I was an exciting fighter and liked that quality that I brought to the ring. Q In your professional career, you fought some vastly more experienced fighters-Buddy McGirt, Meldrick Taylor which you won. Also Kevin Kelly and Fernando Vargas. Can you comment on this? Q What do you regard as your best moment in boxing and conversely your worst moment? My best moment in boxing was the Meldrick Taylor fight. I was considered going in to be a “tomato can”. But I had gotten into the greatest shape of my life. And Meldrick though on the downside was one of the best fighters of his era. Another high point of my career was winning the IBF Inter-Continental Middleweight title in Switzerland. Boxing enabled me to travel internationally. Regarding worst moments, I had a lot of worst moments. One of the worst was when I fought Tony Marshall for the NABF super welterweight title in a 12 round fight the main event of USA’s Tuesday night fights again. I got dropped in the 6th round, but I won probably 9 of the 12 rounds convincingly. Marshall got the unanimous decision and I felt that I got totally robbed in that fight. That was very upsetting as I had the opportunity for a recognized title. Another worst part of my career is that I didn’t always lead an athlete’s life. I enjoyed the party life and it took a toll on my athleticism and cost me against Fernando Vargas and Kevin Kelly. Q-Tell us what you are doing with your life after boxing? A-There was a guy Joe Jingoli; he had been ringside at the Vargas fight in Atlantic City. After the fight I was at a casino feeling somewhat down just hanging out. Some guy came up to me and asked how I was doing. He said he was from Trenton and asked me if I would train him. I took the guy’s card-at that time I was sleeping on my Mother’s couch. I looked up his web site and saw that he was a very successful business man with multi investments. I agreed to train him and he took me to a gym in the Trenton area. Initially, we just sparred and he paid me a hundred dollars a session would take me out for lunch. This went on for a couple months. I got to know him and I told him of some of the problems I was having. He mentored me in many areas of my personal life and saw something in me that I didn’t see in myself. I figured he would put into a good place financially as he was wealthy. I kept training him and eventually he gave me a job with his company working with concrete. It was hard work but it was a job. However, I didn’t really like the job and mentioned it to him. He said OK and gave me two pair of mitts and said” OK become a boxing trainer” and have your own business. I didn’t take a financial hand out though. I went on unemployment, fixed my credit rating. I got a loan opened a gym. I started with one client. And I was clean and sober, becoming successful, and enjoying life for the first time. Also I had a spiritual awakening everything in life I saw in a different way. From the one client after a few months I was doing about 40 to 60 sessions a week. Q-Anything else you’d like to say to the readers and fans? A- I made a lot of mistakes in my early life and went down a lot of wrong roads. But I’m happy to say that today I’m a very spiritual guy, I believe in Jesus. There’s lot of people in the boxing business that take advantage of fighters with no business acumen and have no scruples. When I signed the contract for the Vargas fight it was for what I was told was $30,000. In good faith, I’m not a business person I signed because I trusted.By the time all of the people involved took their piece I came home with $19,000. I should have walked away with $40,000. That was one of the turnoffs of the business aspect of boxing. As now that my gym and boxing training has blossomed. I’d like to get involved with professional fighters and helping them start their careers. My strong spiritual beliefs give strong ethics. I would want to be a part of an aspiring boxer’s career and they could be assured that I would respect that it is their sweat and blood in the ring and would look out for their best interests. Additionally, I want to take the opportunity on this public forum. I want to thank my partner Tony Petruzzelli and his wife Joan for all they have done for me in my life. At one point after several years of sobriety I fell off. They helped me get back on and helped me somewhat financially. They have treated me like a son and I want to express my unending gratitude.